The process of removing a tree stump varies, depending on what kind and size of stump you’re dealing with. For example, pine trees have wide, flat root systems, while the roots of oak trees go straight down and are therefore harder to take out. Whatever the case, the job often requires using a stump grinder, or stump cutter. A stump grinder does exactly what the name implies: It uses a rotating disk to chip away at the wood until all that remains are small pieces. If you’re in need of tree stump removal in Fort Worth, Dallas or the surrounding area, contact Integrity Tree Care today. Hand-digging: This method will only work for small trees with shallow roots, with the help of a shovel or grub hoe and a root saw. 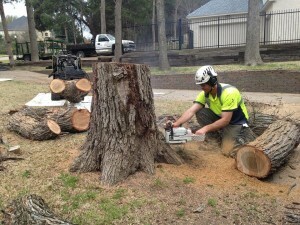 Stump grinding: Did you know that a grinder can be the size of a lawn mower or a large truck? Either way, the process is the same; a rotating machine with teeth grinds up the stump and roots into small chips, reaching 6 to 12 inches below ground level. Some heavy-duty grinders can do away with a stump in a matter of seconds. Chemicals: Garden supply stores carry a variety of products that are designed to speed up the rotting of a tree stump. You simply drill a few holes in the wood, pour in the chemicals and wait. But you’ll be waiting for a fairly long time, so this isn’t the best option if you’re in a hurry to see the stomp gone. If the stump isn’t ground down to chips, it can sometimes be buried on-site; it just depends on the property owner’s preference for disposal. 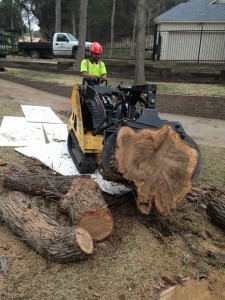 We’re more than happy to help you with tree stump removal in Fort Worth, Dallas and the surrounding area. Our team is well-trained to handle any of your tree-care needs. Call us today!